What does the app do? And who created it? The app provides a guideline for any Project Manager that wants to check his/her schedule and compare it to industry standards (the Project Management Institute’s Practice Standards for WBS and Scheduling as well as generally accepted best practices to be exact). The App was created by Sensei Project Solutions, a company we have seen earlier in book reviews and also on Project conferences such as the Project Virtual Conference. The App loads on the right side of the Project Pro application, but it’s easy to move, size or close the App. The app has a couple of tabs that provide the user with helpful graphics or additional information. In the options menu you can change settings for the compliance score (to add ‘Warnings’ and ‘Messages’ as well as the ’Issues’). There is also a Guidance and Help sub tab that helps you understand the app in more detail. 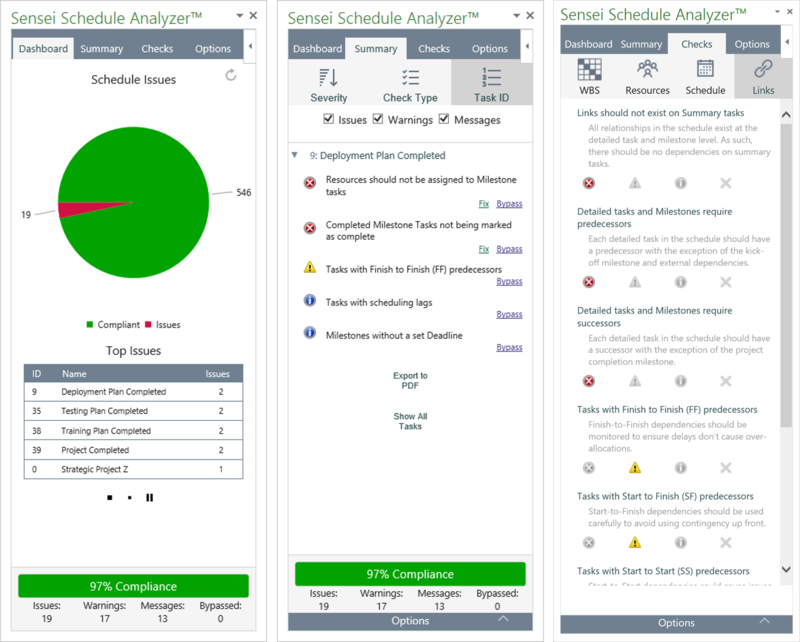 The Dashboard page shows the overall compliance score for your schedule with supporting charts and tables for ‘Top Issues’ and ‘Top Non-Compliant Tasks’. There is even a drill down functionality that helps you get a more detailed view on the issues. During the testing Kenneth mailed me and told me about updates coming to the app, and there is now an extra dashoard available compared to the first version of the app. Great job guys! The Summary page shows all ‘Issues’, ‘Warnings’ and ‘Messages’ by Severity, Check Type and Task ID. There are options available to bypass an issue or you can choose to fix it or fix all issues . On the Checks tabs, you can review and see a detailed description of each check as well as set the severity level for each or choose to ignore certain checks. Before diving into the pricing of the app I will share my experience using the app. 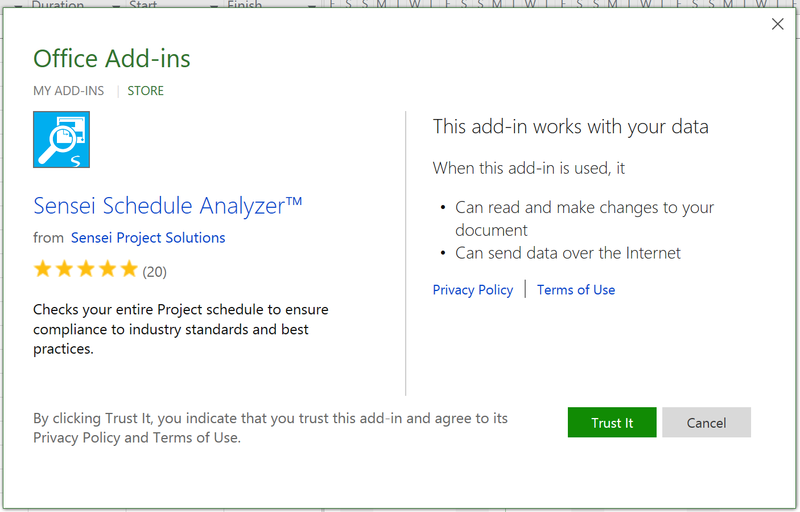 I tested the App for a while now and can say that I am (very) happy with the added value it provides to Project Pro. But let’s look at a real schedule! 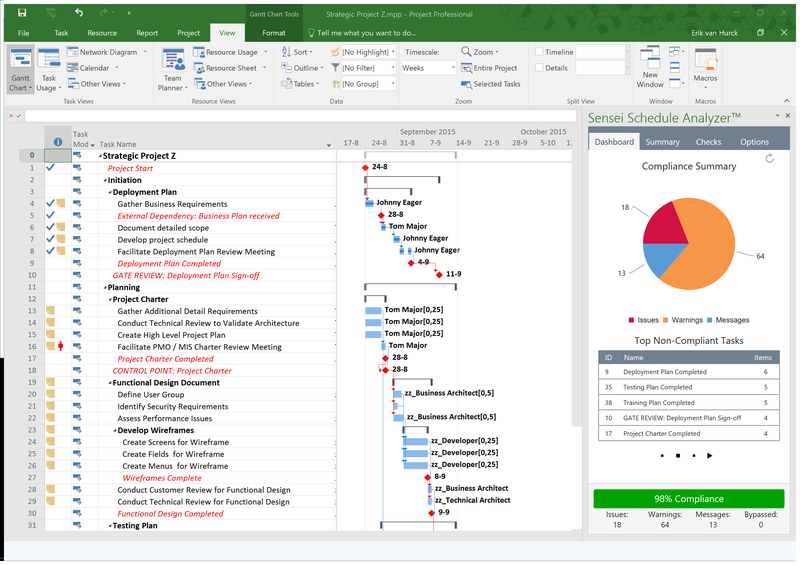 That looks more like it, the schedule has a few obvious issues like the project starter not having a predecessor (to know more about linking tasks have a look at this post). But the schedule is 40 tasks big, and might take you some time to walk through all the elements that could be optimized. This is where the Sensei Schedule Analyzer really proofs it’s worth! Without much delay you get a great dashboard such as the one on the screen above. There are a good number of things to take a closer look at. Currently the compliance only takes into account the Issues and I’m at 98%. I can change this to include warnings and messages as well and the compliance changes to 87%. 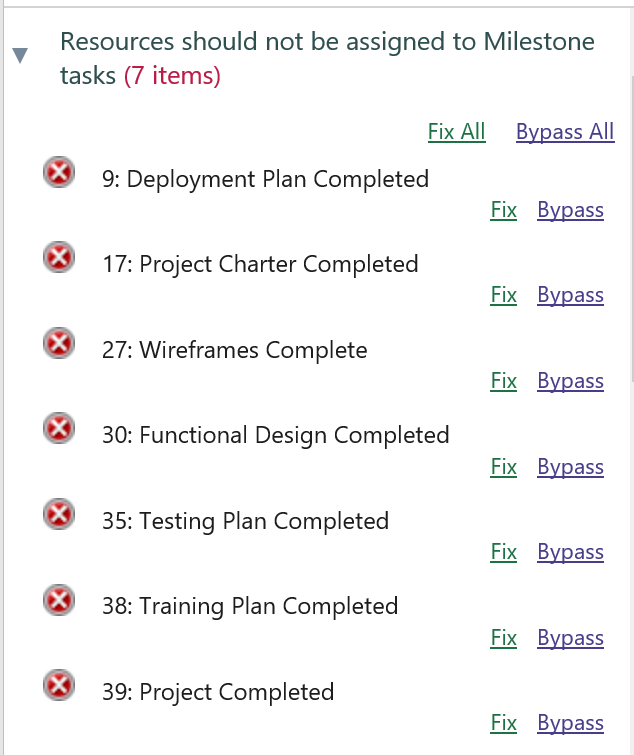 Cool: 18 issues, more warnings than I have tasks.. and 13 messages. The summary has a scroll bar, giving you an indication of the amount of things that could be better. What I really like here is the Export to PDF (I’ve included the PDF in the TPC OneDrive if you are interested). The fix functionality needs a little disclaimer, it would be my advice to use it sparsely. This is not because the option doesn’t work, but more because it takes away the learning curve and attention of you as the schedule owner. Take maters in your own hand, and only use the fix option if you already know what hitting the button will do within the schedule. Now that’s nice, a great app, and a promise it will get even better! There are two ways to get a hold on the app, individually and through your enterprise. It will sell for $299 per user in the store, but is also offered as an enterprise option that is side-loaded into an organizations’ app catalogs. This is a great app with a lot of effort put into it! It provide useful information for the beginner and the pro and it just looks amazing! The guys at Sensei really did their best to provide a premium quality app. If you liked the post and would like to see more App reviews please let me know in the comments. And if your experience with this App is different from mine, negative or positive, I would also be glad to know your opinion. I would like to close this post by adding that I have no affiliation with the product and will not receive any commission on sales through any of the links on this post. This is different from my book reviews where I do get a small fee on any sales (without extra costs to you). I even reviewed two books written by Kenneth Steiness, who is the CEO of Sensei Project Solutions. You can find the link to the reviews here and here. Previous Previous post: Project Server workflows, do or don’t? Next Next post: Happy Easter and welcome to the new Project Corner Blog!